Yes, for the bargain basement price of 108 skirmish marks, you can upgrade your soldier’s power-over-time spell by 0.8 power every 3 seconds. 108 marks is about half what you get for a skirmish with the daily bonus. The herbalist likes to cast Nature’s Power on itself at the start of a fight, although it may decide to give you a recharge once its cooldown is done. Looking at the other skirmish trainer options past rank 10, this seems typical. 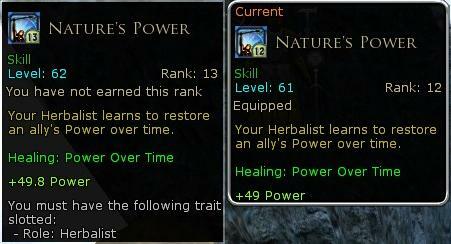 I could also spend 132 marks to upgrade the herbalist’s armor by 6. Six. Skirmish training is hard-capped at 20, but it seems soft-capped at 10. Lower ranks increase quickly and cheaply, which was the stated design intention, but the curve becomes a wall in the latter half. It is a microcosm of MMOs generally: early on, large and quick increases in power; once you feel committed, increasingly small increments for increasingly large investment. On the other hand, I guess that encourages me to spend my marks on those Empowerment scrolls. I’m not sure this one is all bad. The entry barrier to getting a new soldier’s skills up to passable levels is moderately high as is, and some players may want two separate soldiers for solo versus group skirmishes. I’m planning on test-driving as many as four different soldier types, and I’m just as glad to be able to declare victory on my herbalist and start working on the others. I noticed this as well, but also a part of it might be due to them hitting level 65ish around level 10 of their skills (I could be wrong here, but I know I’m close to 65 on a couple skills). But I agree with GreenArmadilo – I kinda like the way this works as it does allow us to have a couple different soldiers ready to go and not just one tricked out soldier. I agree. The scaling of the cost seems to be a huge issue to me. I was pretty happy being able to do one skirmish, level up some skills, rinse and repeat. However, after a while suddenly I find the situation flipped and having to do several skirmishes to level up one skill. It starts to feel like a huge chore instead of fun. So far I’ve only purchased one cosmetic change and spent the rest of my marks on skills, but soon that might change as well just so I can get that feeling of being rewarded back. I really like the fact that you can buy nice gear and even Carn Dum items with skirmish marks. Gives me a good reason to keep doing them long after the soldier is buffed sufficiently. It’s actually based on your level, for the costs. You’ll see once you are making the effective level (mouse over the skill) greater than your own, the costs GREATLY increase. That said, each skill seems to have it’s own cost. I just maxed the last of my archer’s skills to 20, medium armor, for a cost of a mere 648 marks. Compare this to her attack skills which cost something like 1800 marks each. And my herbalist’s costs are bargain basement cheap for all of them. Next Next post: LOTRO Vol. 3 Starts in Dunland?